Brochelle Vineyards’ eclectic tasting room stands in sharp contrast to its understated location in an industrial complex along Paso Robles’ 46 East corridor. Owners Michelle and Brock Waterman proudly point out the textural design of the salon. The contemporary black and white theme is juxtaposed with elements such as the decorative copper ceiling, the barrel stave-designed bar counter, faux alligator wainscoting on the walls and the stunning wine glass chandeliers. The couple will also tell you the origin of the winery’s name, Brochelle, a blend of their names — Brock and Michelle. Brock, who hails from Clovis, and Michelle from Los Angeles, fell in love with the rolling hills of Paso Robles. Their first vintage in 1998 of 50 cases of wine has grown to an annual production of 2,600 cases. “When we came there were 30 wineries here,” recalls Brock. The 20-acre vineyard located on Nacimiento Lake Road is planted with zinfandel, syrah, petite sirah, grenache, alicante bouschet and mourvedre. The chardonnay is sourced from Santa Maria Valley and cabernet sauvignon from Calaveras County and Templeton. The tasting begins with the 2014 Chardonnay, a scintillating wine laced with tart fruit flavors and bracing acidity. The 2013 Silk, a luminous blend of syrah and grenache is also sourced from Santa Maria Valley. The 2012 Foothill Cabernet Sauvignon, sourced from Sierra Foothills has concentrated stone fruit flavors with hints of eucalyptus. The estate wines include the 2012 Grenache laced with red fruits is produced from a mere 400 head-pruned vines. Bursting with fruit and floral notes, the 2013 Estate Zinfandel shows a silky finish. The inky black 2103 Estate Syrah is rich with ripe cherries and the 2013 deep-hued Estate Petite Sirah is lush with concentrated black fruits. The 2013 Luxe Cuvee is a classic GSM blend of grenache, syrah and mourvedre — luxurious on the palate with hints of chocolate. The special XVI Anniversary Cuvee is lush with ripe red raspberries. This program started as a small project to celebrate the winery’s sixteenth anniversary, noted Brock. A blend of syrah, zinfandel, petite sirah, grenache, mourvedre, cabernet sauvignon and alicante bouschet is selected from ten best barrels for this cuvee (blends change each year). The piece de resistance is a tasting of two late harvest zinfandels: Velvet and Cashmere. The 2004 vintage aged in the barrels for eight years was bottled in 2012. Brock explained that Velvet, elegant as a ruby port, was aged in the thick-staved barrel while Cashmere, reminiscent of a classic tawny port, aged in a thin-staved barrel. “The original intent was to bottle them together,” said Brock. But when he tasted the two wines after a seven-year aging, he decided otherwise. The two wines (not fortified) are distinctly different. Velvet is dark and rich laced with honey notes. Cashmere, lighter in color, is slightly nutty with butterscotch notes. A total of just 45 cases are produced of this very special dessert wine. 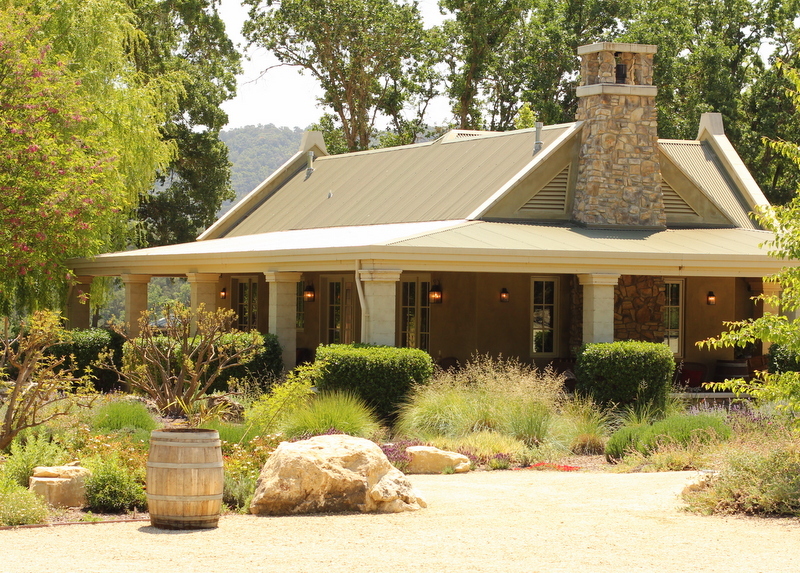 Brochelle Vineyards has two tasting rooms. The Eastside location is at 2323 Tuley Court, # 130 in Paso Robles and is open Friday, Saturday and Sunday from 11 a.m to 5 p.m. For more information call (805) 237-4410, ext. 1. The Westside tasting room is located at 6996 Peachy Canyon Road in Paso Robles and is open daily from 11 a.m. to 5 p.m. For more information call (805) 237-4410, ext. 2.